It was a crime that shocked the nation, caused rampant paranoia among the hippest musicians and actors in Southern California, and put an abrupt end to the peace and love vibe of the 1960s. The brutal murder of 8-months pregnant Sharon Tate and four others at a home in Benedict Canyon on Aug. 9, 1969 frightened and fascinated the nation. And Charles Manson’s “family” became infamous. While Tate along with Jay Sebring, Abigail Folger, Wojciech "Voytek" Frykowski, and Steven Parent have been gone for more than four decades, those years have been filled with sadness and anger. Not everyone who tried to move on ever could. 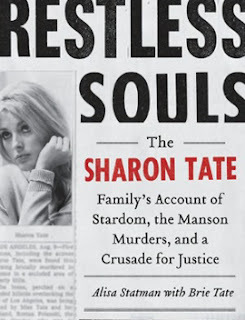 Restless Souls—The Sharon Tate Family’s Account of Stardom, The Manson Murders and A Crusade For Justice is a new account of the murders and their aftermath. The story is told from the perspective of the Tate family. And this story is pieced together by two people: Alisa Statman, who was Patti Tate's (Sharon's sister) domestic partner; and Brie Tate (Patti's daughter), who was born years after Sharon died. They rely on a mélange of interviews with family members, personal letters, tape recordings, published interviews, documents about the crime and the trial. Some of it comes directly from personal journals and memoirs penned by Doris Tate (Sharon’s mother), Paul “PJ” Tate (Sharon’s father), and late sister Patti Tate. The book describes the Tate family's early days before Sharon became an actress, and their frequent moves because PJ was an Army intelligence officer. It then recounts Sharon’s early days as a struggling actress, her engagement (later broken) to hairstylist to the stars Jay Sebring, and her subsequent marriage to womanizer and film director Roman Polanski. The story is mostly told from the perspectives of Doris, Patti and PJ and their insight as Sharon became a rising star in Hollywood. It's especially jarring when we hear how each family member reacted to the news of Sharon's death. One father's quest to find justice and the impact on a family. Doris retreated into herself, inconsolable and in shock. Just a child, Patti was confused and in disbelief. And PJ did what his military training taught him to do. He went to the crime scene to investigate. His recollections are especially gripping. He and his Army friends went undercover to conduct their own investigation in hopes of finding out who was responsible. It was their detective work that eventually delivered the lead that ultimately resulted in the arrests of Manson and his cronies. Once arrested and safely behind bars, PJ later lamented that he preferred to see them set free. He could have extracted his own personal brand of justice for what they had done. Over the years, Doris is never able to heal from the loss of Sharon, but does find a purpose in ensuring that the convicted killers would never get parole. Her tireless work on behalf of victims and their rights resulted in a bill passed California that gave victims the opportunity to make impact statements. Her work was later carried on by daughter Debra, who only receives a small mention in Restless Souls. Although Statman and Brie allude to Debra being “estranged” from the family, this perspective really isn’t accurate. In fact, Debra continues to advocate for victims' rights to this day. She also maintains the Sharon Tate fan site and Tate family legacy site. And her perspective is sorely missed in the book. The book does a solid job sharing a one-sided perspective. Restless Souls does fill in some of the gaps from the family’s point of view. But it will make some people wish that Doris’s own memoirs and PJ’s completed manuscript “Five Down On Cielo Drive” would have been published. And that really is the book's true weakness. Poetic license is taken, in some places too liberally. For example, it seems unlikely that Statman would know exactly what Tate was feeling when the killers confronted her. And then there are other areas where the book lags from it all, including Patti’s dreams of Sharon in painstaking detail. It's detail the reader would never need or want to know. Likewise, it is understandable that the family would want to protect Sharon’s memory and her legacy. Immediately after her death, the media had a field day with outlandish stories of drugs and drug-fueled orgies at Sharon’s house, in which she was supposedly an avid participant. Those stories do seem doubtful. The Los Angeles coroner provided the evidence; there were no traces of drugs in her system the day she died. For people who are less familiar with the crime and the case, it might not even be clear why the book was published. If anything, Restless Souls is a companion piece to Helter Skelter, which was written by prosecuting attorney Vincent Bugliosi with Curt Gentry. While Bugliosi did a fine job, there were certain perspectives of the case that he was not privy too — and that includes those of the Tate family. Restless Souls By Alisa Statman And Brie Tate Merits A 3.4 On The Liquid Hip Richter Scale. The best of Restless Souls puts emphasis on PJ Tate's involvement with the case, something that Bugliosi might have undersold in his rendition. It also changes the intent. Whereas Bugliosi wanted to get inside the minds of the murderers (and frighten us all), Restless Souls provides a glimpse into the minds of the victims lost and left behind. The book includes family photos but there is nothing from the crime scene. Those can be found in Bugliosi's book. Restless Souls can be found on Amazon, as can Helter Skelter. You can find Restless Souls at Barnes & Noble. iBooks offers an enhanced version of the book. The audiobook is well produced with its multiple narrators. It does get grating when the childhood remembrances of Patti are delivered with a bit of a little girl voice, but listed narrators Eliza Foss, Gabra Zackman, and Therese Plummer do well. So does the unlisted male who narrates PJ's recollections, who is outstanding.